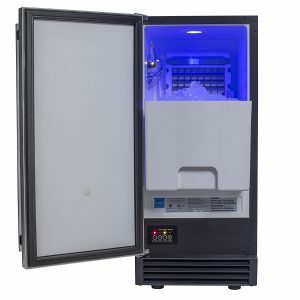 Chef’s Exclusive CE101 is an Energy Star rated commercial grade ice maker with a 60 lb. per day crystal-clear slab ice cube capacity under the right conditions. It is suitable for use both at home and commercial settings and both as an integrated under the counter or standalone unit. 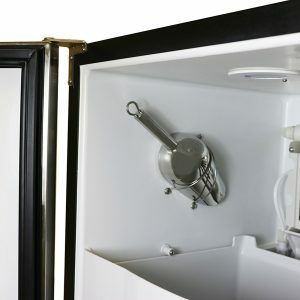 The removable ice bin has a 25-pound capacity and slides out easily for when you want to put it on the kitchen counter or move it elsewhere. It has a reversible stainless steel door with a very long door handle that you can install from the left or the right. The clear ice cubes it produces measure 1 x 3/4 x 3/4 inches. Chef’s Exclusive CE101 has a sleek, elegant and modern design and you can use it as a freestanding ice maker. It weighs 92 pounds and measures 23.4 x 14.6 x 32.6 inches. It is 14.6” wide and you may want to pay attention to that if you want to fit it in a specific space in your kitchen. There is a blue LED light inside that works when you open the cooler door for you to see everything clearly in the dark. The easy to operate control panel is at the bottom on the left, just below the ice bin and has the On/Off, Clean, Adjust and Mode buttons. You don’t have to give much thought to the operation of the unit. It is a simple plug and play or set it and forget it type ice cube maker with a regular NEMA 5-15P power cord for household use. In the box, you’ll get an ice storage bin, a drain hose, a high-polished stainless steel scoop and an internal scoop holder that you see in the photos. There is an integrated drain pump which will help when the drain hole on the ice maker is lower than your drain. This gives you a more convenient and flexible option for set-up. The ice cube maker stops working automatically when the 25-pound capacity bin is full, with the auto overflow protection. Energy Star rating means it consumes less energy than similar models with its energy efficient design. It also holds NSF 12- National Sanitation Foundation certification for food or drinks safety for human health and UL 563- Underwriters Laboratories certification for product safety. It is designed to work well in different kind of settings, including home and commercial kitchens, basements, garages, game rooms, offices or patios. There is a user manual included if you need help with set-up or operation. Chef’s Exclusive CE101 is not cheap but you get what you pay for.